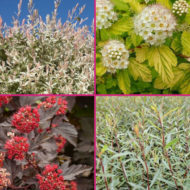 This selection of Spirea almost makes us giddy! 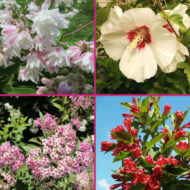 Expect incredible flower coverage in clusters and cones, wonderfully mounded shrubs with vibrant yellow to gold to green foliage, and very attractive red and purple new shoots. 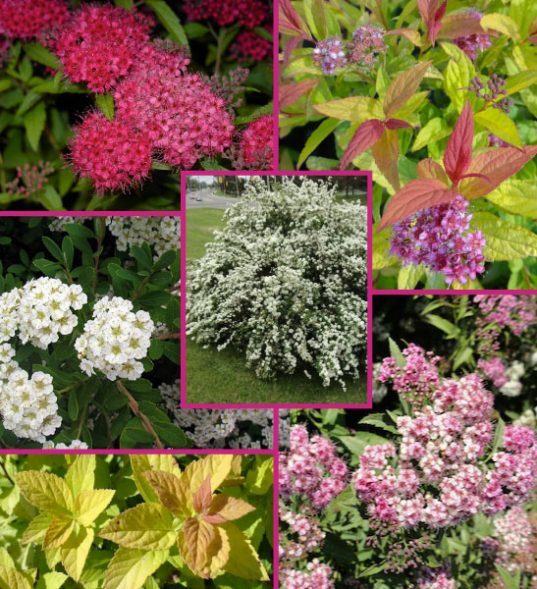 It’s a smashing group of six of the trendiest Spirea. 6 shrubs in combo. Plant varieties depend on availability. Spiraea japonica ‘Shirobana’ – Shirobana Spirea. 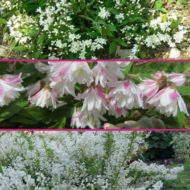 Unique white and pink flowers on the same shrub. 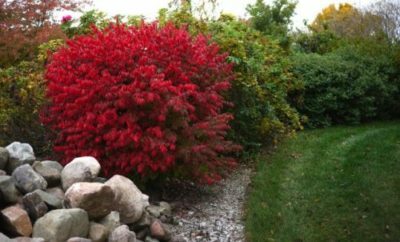 Spiraea bumalda ‘Flaming mound’ – Flaming Mound Spirea. 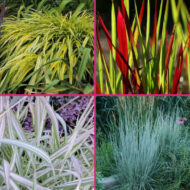 Attractive new red shoots and yellow foliage, and pink flowers. Spiraea japonica ‘Anthony Waterer’ – Anthony Waterer Japanese Spirea. Dark green leaves & purple red new growths. Deep red flowers. Spiraea japonica ‘Goldmound’ – Goldmound Spirea. Gold leaves and pink flowers. Spiraea nipponica ‘Snowmound’ – Snowmound Spirea. Small white flowers completely cover upper sides of branches in spring.